The rooms at the Monte Carlo have an unpretentious luxury, whether you plump for one of the rooms or even push the boat out and book one of the top-of-the-range Diamond Suites. 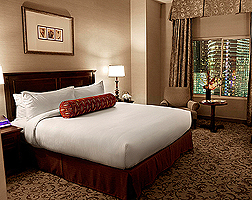 Deluxe Rooms have the choice of one king-sized or two queens. You’ll enjoy thick mattresses, crisp sheets and plush white bedding. Facilities include a 40” TV, iHome docking station, electronic safe, internet access and, to keep you looking smart, an iron and ironing board. Of course, in this and every other room, you’ll be able to call on the AAA 4-diamond service that makes a stay at the Monte Carlo extra special. On a High Floor Room (on floors 21 and above), you can see it all: the mountains, the Strip twinkling below, and the impressive neighbouring architecture of the City Centre. Besides the usual Deluxe features, you’ll have cable TV and in-room movies. Spa Suites are an impressive 700 square feet, twice as big as a regular room. As their name suggests, these suites have a full-size Jacuzzi tub, with views. An open-plan layout features a king-sized bed and extended sitting area. There is a bath with a separate shower, and a wet bar with a sink and fridge. The same size as the Spa Suite, a Monaco Suite has a giant bath with whirlpool jets, as well as a mini fridge. On the higher floors, the Diamond Suites are a giant 825 square foot and have a separate master bedroom, huge bath, 2-person Jacuzzi and an extended wet bar for entertaining - truly awesome.